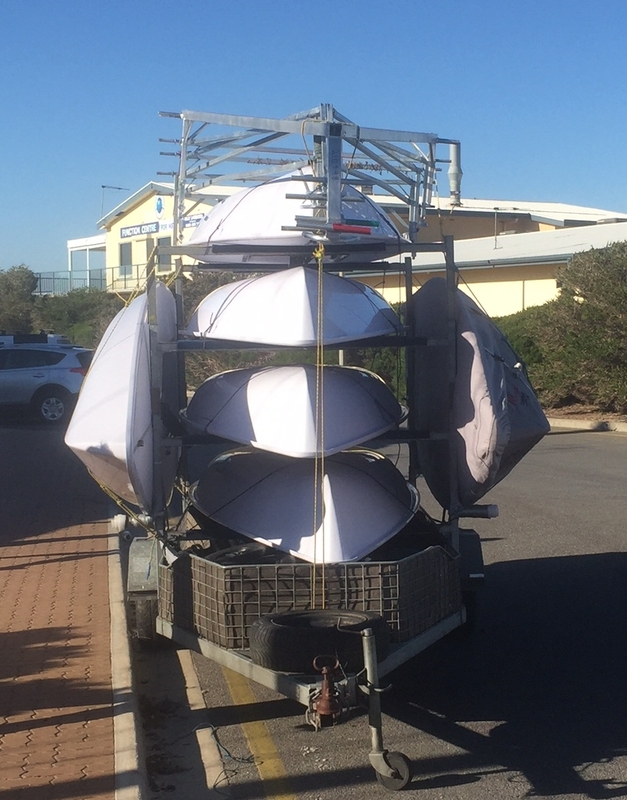 Laser sailors will go to great lengths to get their boats to regattas to enjoy the racing. The photo here was taken at the 2017 Adelaide Nationals. It shows a sterling effort. If anyone has a photo of a larger Laser sandwich we will be happy to publish same or perhaps to create a new Guinness Records classification for the endeavour. Never to be outdone Matthew Blakey reports that 9 Kiwi Laser sailors transported their boats from Melbourne to Adelaide for the 2003-2004 Nationals in the configuration below. It is a bit hard to see all the boats but we know Kiwis can count and as there are eight Laser sailors in the photo we are assuming that the 9th was the photographer so 9 is the current Laser sandwich record. Our European travelling Laser representative Jeff Loosemore sent this hard to beat contribution to the how many Lasers can be packed on a trailer competition. This is the Spanish team’s Laser trailer complete with 19 Lasers in Gydnia Poland for the Laser Masters Europeans 2015. Laser legend Mike Mills with wife Jan has sold, serviced and transported way to many Lasers to count. Mike has a good memory and has called for the video ref on the New Zealand effort above while offering his own in the message below. Great to see one of my old trailers still being put to good use. Jan and I used to load them on our own and they were road legal. The Kiwi effort from 2003 -2004 did get booked for being too wide, so does it count? From memory our best and biggest load was 25 boats on a semi that brought boats to Royal Brighton for the World Cup, I think in about 2006 . This was hand loaded and unloaded. These were before I was working for PSA when we did move quite a few boats. I was always too busy to take any photos.